Earlier this year, Josie was able to meet Lindsey Voreis in person at a mini grit clinic held in the CAMBA area. 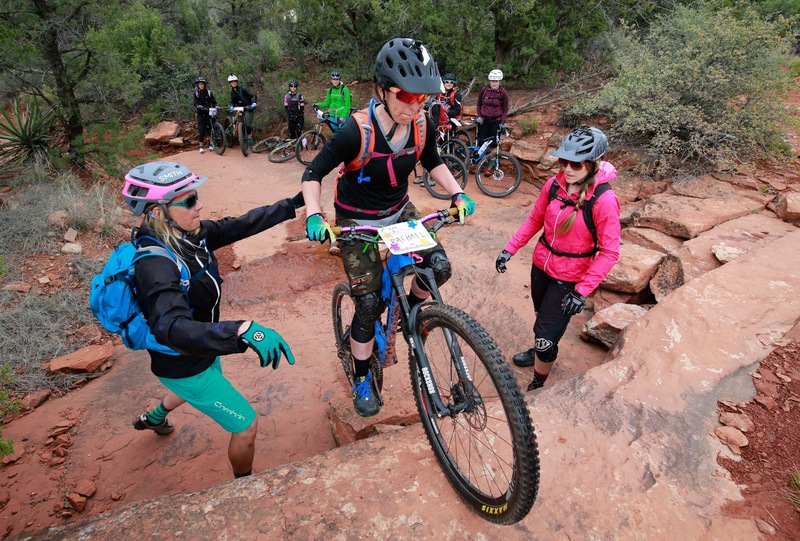 Josie left feeling more inspired and motivated than ever to continue her mission to encourage more women to ride off-road, thus, she wanted to reconnect with Lindsey to catch up with what all had changed since the first interview in 2014. Lindsey, the Director of Inspiration, travels the world with Liv Ladies AllRide to inspire and help other women to find their #bikelife. Riding for Lindsey isn't just a fun way to pass the time, but it helped her get thru some tough patches in life. A true testament yet again to the power of two wheels and how they can be healing. 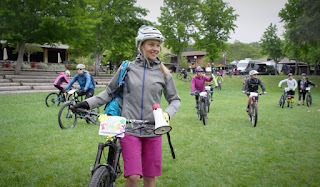 We interviewed you about two years ago, since then you have had many women's ride clinics- has everything stayed the same or have you found ways to improve the clinic environment? We are constantly finding ways to improve the clinic environment. 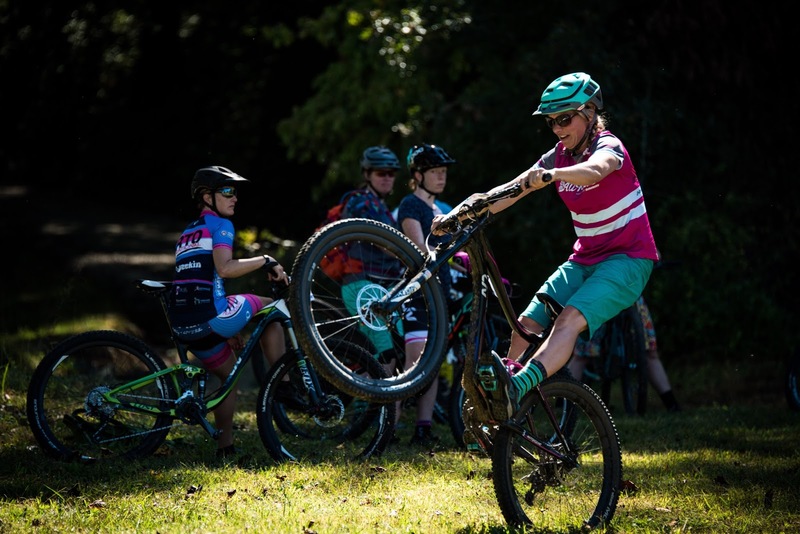 We want to make sure we're throwing events that invite women into the sport and help them fall deeper in love with mountain biking and the lifestyle that comes with it. We have adjusted our teaching techniques to include examples that relate to other sports to help ladies understand the sport better. We were fortunate enough to attend one of your smaller grit clinics (it was awesome!) One thing we thought was neat was how you had everyone introduce themselves and share a bit about their #bikelife. Why do you feel it's important for folks to open up, even yourself? 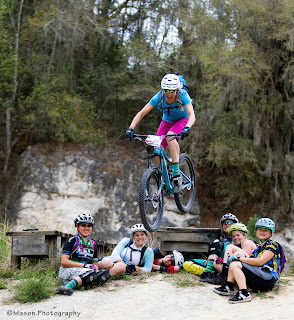 I think it's important to have ladies open up about why they mountain bike and what it's done for their lives because it loosens up the vibe. This gives women insight into other women's heads right away. Mountain biking has done something to enhance people's lives or they wouldn't be doing it or interested in it, so by putting that out on the table right from the get-go, it puts us all on the same page and helps everyone drop their egos and be equals. It also helps ladies see how mountain biking can be so much more than just riding a bike if they haven't thought of it that way yet. How do you help take care of yourself and prevent burnout or exhaustion when you're living the life of a traveler and mountain bike coach? I am a healthy, clean eater for the most part. I try and have green drinks and lots of veggies all the time to fight viruses. I stay hydrated and get my 8-9 hours of sleep each night. I was born with boundless energy, so I'm pretty good at constantly moving. What has been one of the biggest changes in your life since we talked with you in 2014 and how has that influenced you and your #bikelife? One of the biggest changes has been starting my own brand of clinics with a new business partner from Bend. Ladies AllRide MTB clinics were born in Jan 2015 and my partner, Meredith is a dream come true. I have learned so much about working with the right people and how amazing women can be to work with when you have the right chemistry, passion and open communication. She's a dream come true for me and Ladies AllRide. When it came to creating your own brand of clinics, what would you say was the biggest challenge? There are so many details that go into running an event. When I first started branding clinics with the AllRide name, I co-branded with a woman in Colorado and she did the coordinating and ran the clinics. When we parted ways due to a sponsor conflict I didn't know who was going to run the events for me. Details and organization are not my strong suit. Finding the right partner who understood my mission, was easy to work with and allowed me to take on my strengths seemed like it would be a challenge. But luckily I found my partner Meredith right away and she was the perfect fit from the get-go! However, it took a year and a half, and another partner, Summer, to work out kinks and get the program up and running smoothly. It's not an easy feat to run so many events in different parts of the country. I'm so lucky I found my soul-partners! What do you love most about having your own brand of clinics? Was there an element missing from the original clinics you held that you are now able to incorporate? It's actually easier to just show up and coach for someone else's event!! ha! What I love about having our own brand is we get to choose who we work with and the team we've put together makes me smile every single day. When I taught for other clinics in the past I felt like there was an emotional component missing. I didn't feel like I was connecting with anyone beyond doing drills on my bike with them. It's hard to put a finger on why exactly, but I believe the vibe at our clinics is unbeatable AND our instructors are some of the best and most experienced in the business. What do you hope to accomplish with your clinics during the next few years? I hope to attract more women into this sport with our clinics. I hope people taking the clinics are telling their friends who don't know about mountain biking that there is a way in and we're it! 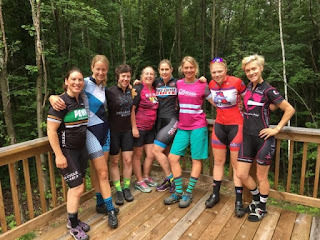 I hope to gain recognition globally as THE place to come if you want to connect deeper with the sport of mountain biking, meet women to ride with and have your minds blown at what you can do on a bike! What would you say is your greatest achievement with your brand/clinics? I could say the greatest achievement is selling out every clinic last year before June without much marketing. That is a HUGE accomplishment and I'm very proud of that. 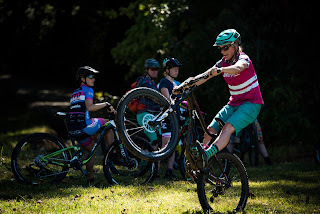 But I'm mostly proud of the team I get to work with, what they've taught me, what I've taught them and the reach we collectively have to get more women stoked on bikes! I'm also really proud to be supported by such amazing companies like Liv, SRAM and so many more. It's unreal. Truth time! When you first started out mountain biking, what were some of the technical skills that challenged you? What helped? When I first started mountain biking going fast scared me. Any steep downhills with ruts in them scared me and I would get off and carry my bike down them. This usually resulted in falling and getting tangled up in my bike. What helped was learning how to ride from my feet and maneuver my front end with my hands instead of just braking and holding on for dear life. Is there any technical mountain bike skill that still challenges you today? I would love to hold a wheelie and manual longer than I can. I would love to bunny hop higher and have more confidence and style jumping tables. When it comes to folks new to mountain biking, what would you say are the top 5 essentials that one should look into for products/tools/etc. Hmmm, I think good clothing for comfort, a good helmet and shoes. A bike that is comfortable and well-built that is set up properly for the rider. The things to think about these days are wider bars are more stable than narrower bars. A shorter stem is more stable than a long stem and a seat dropper will help you stay balanced and centered over the bike on downhills and in technical terrain at speed. Where has your favorite place to mountain bike been while you traveled during 2016? Favorite place is a loaded question. I love to ride my bike and part of the joy is experiencing different types of trails all over the world. I love red rocks and shelf riding like in Sedona and Moab. I love the zippy fun trails in Copper Harbor, MI, I love the DH trails at Snowshoe MT and I love the riding at Kingdom trails and East Burke, Vermont and the trails in Brevard, NC are pretty rad. Sweet trails are being built all over the US so it's an exciting time to be a traveling mountain biker! What has been the most influential moment for you during one of your clinics? How did it inspire you? I am influenced and inspired at every clinic. Seeing ladies face fears and do things they didn't think they could do fuels me and inspires me to keep doing what I'm doing. When I hear ladies' stories of perseverance, or any life-changing affect mountain biking has had on them, it inspires me. When women express to me that their lives are changed because of the clinic, that inspires me more than anything to continue on my mission to educate more women about the power of mountain biking. 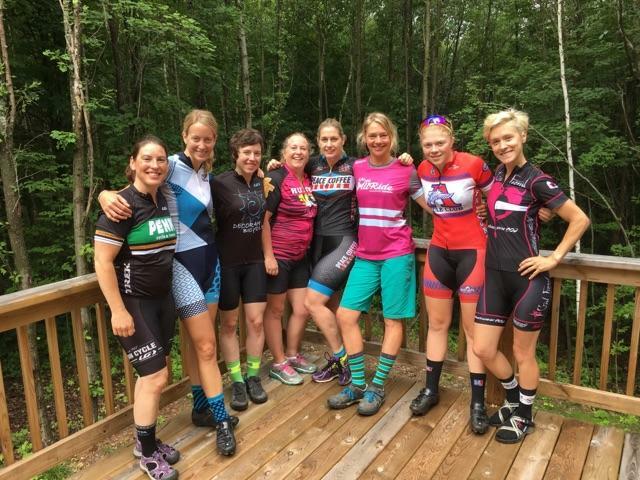 What would you like women to know about the Ladies AllRide clinics and what can they expect when they attend one? What do you feel industry wise and/or locally can be done to encourage more women to be involved with cycling and the cycling industry? I think Liv is doing a great job with their ambassador program around the world. Women need to be invited into this sport. It's really hard to assume they'll decide to try it on their own one day, they need an invite. The Liv ambassadors are out there to create inviting women's events to help women get into the sport in a non-intimidating way. I also think brands are making more products for women and it's making the industry feel less intimidating and more inviting to women. It's happening and I'm so proud to be a part of it! In your own words, why should more women get involved with mountain biking and why is it such a positive thing to be involved with? I could go on and on about this... Basically mountain biking is a physically demanding sport that can be scary and intimidating. When women put themselves in scary situations, then find the strength to seek first to understand the situation and how to get through it, then accomplish it, it can literally change lives. A sport like mountain biking teaches us how to think differently, how to choose our thoughts carefully to keep us moving forward, how to allow only positive thoughts in to create positive outcomes. Mountain biking is the best at teaching us about ourselves and how to handle life. Last question- if you were to ride anywhere in the world, where would you go? I get to ride almost anywhere in the world! :) I guess bucket list places would be New Zealand and Scotland. :) I'll get there.